In this Nov. 14, 2018 photo, Secretary of Defense Jim Mattis and Homeland Security Secretary Kirsten Nielsen, third from the right, visit Base Camp Donna, in Donna, Texas. Mattis says the White House has given him the authority to use military troops to protect Customs and Border Protection personnel at the southwest border. This could, under certain circumstances, mean directing troops to temporarily detain migrants in the event of disorder or violence against border patrol agents. 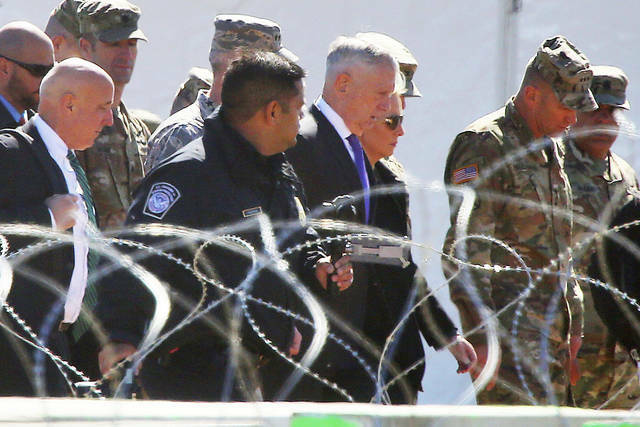 WASHINGTON (AP) — Defense Secretary Jim Mattis said on Wednesday the White House has given him explicit authority to use military troops to protect Customs and Border Protection personnel, with lethal force if necessary, at the southwest border. This could, under certain circumstances, mean directing troops to temporarily detain migrants in the event of disorder or violence against border patrol agents. “This is minutes — not even hours” of potential detention, Mattis said, suggesting that he was not planning to use the military to operate migrant detention camps. “We’ll keep you posted on any new missions and any new numbers of troops as those decisions are made,” he said. The mission thus far for the approximately 5,800 active-duty troops in the border area has been mainly to lay barbed wire and other barriers along the border and to transport border patrol personnel. Mattis has stressed the need to keep the military away from civilian law enforcement roles such as arrests, which are forbidden under the Posse Comitatus Act. The law prohibits the federal government from using the armed forces in a domestic police role, except in cases and under circumstances specifically authorized by the Constitution or Congress. The basis for the expanded legal authorities for Mattis is a belief by the Trump administration that the caravans of Central American migrants, whose numbers include many families with children, moving toward the U.S. border pose a potential security threat to the border patrol. On Tuesday, Homeland Security Secretary Kirstjen Nielsen visited a San Diego Pacific Coast beach to see up close newly installed razor wire wrapped around a towering border wall that cuts across the sand. She said there were as many as 500 criminals and gang member in the groups heading northward, though she refused to answer questions about how they were identified or what crimes they had committed. Mattis emphasized that he would use his expanded authorities only in response to a specific, detailed request from Nielsen, and that none has yet been made. “I now have the authority to do more. Now we’ll see what she asks me for,” he said. Mattis was adamant that the military will remain within its legal limits. “We are not doing law enforcement,” he told reporters at the Pentagon. “We do not have arrest authority.” He noted that National Guard troops under state control are also involved at the border, and he said the governors of those states could give them arrest authority. He said there are about 2,100 National Guard troops involved. Mattis said that as of Wednesday there were 5,764 active-duty troops performing support missions along the border in Texas, Arizona and California. The number changes frequently. Just a day earlier, the Pentagon said in a report to Congress that there about 5,900 troop involved; at other times the Pentagon has put the number at 5,800. It its report to Congress on Tuesday the Pentagon estimated the cost of the mission at $72 million through Dec. 15, when the mission is scheduled to end. It said the National Guard’s work, which began in April, has so far cost $138 million. Mattis said he was certain the $72 million figure would go up, but he did not forecast any other total.